Wärtsilä Marine Solutions has a strong position in the marine and oil & gas industries. By providing solutions that are optimised, and both environmentally and economically sound, Wärtsilä enhances the viability and profitability of shipping operations and enables the development of sustainable societies. Wärtsilä’s reputation is based on an in-depth understanding of its customers’ businesses, its design capabilities, a broad product portfolio, and technological leadership. The organisation is structured into end-to-end business lines with full control over sales, R&D, engineering, procurement, and manufacturing. This enables increased flexibility, fast decision-making, and the optimal utilisation of resources to provide superior customer service. Wärtsilä’s marine customers comprise both shipyards and ship owners; the needs and demands of which differ significantly. Product prices, delivery times and reliability, project management, ease of installation, and the supplier’s ability to manage large delivery scopes typically affect the decision-making process of shipyard customers. Ship owners, on the other hand, require safe and efficient operations, reliability and support, as well as the availability of services. Their decision-making is also impacted by freight rates, interest rates, and the capital and operating costs of the ship. Both ship owners and operators are increasingly taking other factors, such as environmental compliance and fuel flexibility, into consideration in their decision-making. Wärtsilä is committed to meeting the needs of both customer groups. Success is achieved through a comprehensive understanding of their businesses, operating models, and requirements. This understanding is backed by an extensive network, a broad product portfolio, and the ability to be involved in the life of the vessel as early as the design process. This enables Wärtsilä to support its customers throughout the lifecycle of their installations with products and solutions that best serve their business interests. The ability to combine the products offered into larger systems and solutions supports Wärtsilä's strategy of being the main solutions provider to its customers. This strategy provides added value to both shipyards and ship owners. Shipyard customers can focus on their areas of expertise and benefit from a reduced risk of product interface problems, while ship owners can rely on operational and maintenance benefits. Floating exploration: drillships, semi-submersibles, etc. Floating production units: FPSO's, FSO's, floating LNG, etc. Wärtsilä Marine Solutions is uniquely positioned for growth driven by the increasing availability and use of gas as a marine fuel, the introduction of new environmental regulations, and the increased demand for more efficient vessels. Stricter environmental regulations are driving the interest in gas as a marine fuel, as well as in emissions abatement technologies, such as exhaust gas cleaning and ballast water treatment systems. Marine Solutions offers its customers alternative solutions for meeting these requirements in a way that best meets the needs of their businesses and operating models, both as part of new build projects and as retrofits to vessels already in operation. Wärtsilä was the first company to introduce dual-fuel engines to the shipping sector, thereby facilitating the use of liquefied natural gas (LNG) as a marine fuel. Since LNG contains no sulphur, there is an increasing trend towards the use of LNG fuel as a viable means of complying with the sulphur cap requirements. Wärtsilä also has a strong position in exhaust gas cleaning systems, with the most extensive reference list on the market. Today, the portfolio of SOx scrubber systems is the broadest in the industry and consists of closed loop systems for fresh water use, open loop systems for seawater use, and a combination of the two, i.e. the hybrid system. Wärtsilä’s scrubber systems are approved by the IMO and by the Singapore flag state authorities. For NOx reduction and IMO Tier III compliance, Wärtsilä provides its customers with products based on selective catalytic reduction (SCR) technology. For ballast water treatment, customers can select systems utilising the two most common technologies: ultraviolet treatment and electro-chlorination. Both BWMS systems are IMO Type Approved, are available for both safe and hazardous area installation, and are expected to receive full USCG Type Approval in 2018. Efficiency has become one of the top concerns for ship owners and operators. Wärtsilä’s in-depth expertise and system skills help to optimise the efficiency of vessels, and make it possible for customers to achieve the performance, cost, and environmental compliance parameters that specifically match their operating profile. Wärtsilä Marine Solutions serves the marine and oil & gas industries. The main vessel segments covered in the marine industry are traditional merchant vessels, gas carriers, cruise & ferry, navy, and special vessels. In the oil & gas industry, Wärtsilä is active in serving offshore installations and related industry vessels, as well as land-based gas installations. The global demand for new vessels in the shipbuilding and shipping industries is mainly driven by developments within the global economy and the resulting impact on trade and transportation capacity requirements. The global economy also influences fuel prices, which in turn have both a direct and an indirect impact on the marine and oil & gas industries. Price, availability, and demand are the driving factors in the oil & gas industry, while in the general shipping industry, fuel costs increase the demand for more efficient vessels. Other factors, such as shipyard capacity, newbuild prices, decommissioning and scrapping, as well as interest and freight rates, also affect these industries. Another important driver is the increasing level of environmental regulations and their impact on the demand for optimised vessel efficiency, environmental solutions, and gas as a marine fuel. Wärtsilä Marine Solutions has continuously broadened its portfolio, which today ranges from engines and propulsion equipment to electrical equipment, navigation & automation, ship design, environmental solutions, gas systems, and pumps and valves. This is backed by the capability to build environmentally sound solutions, and by superior service support throughout the lifecycle of the product. 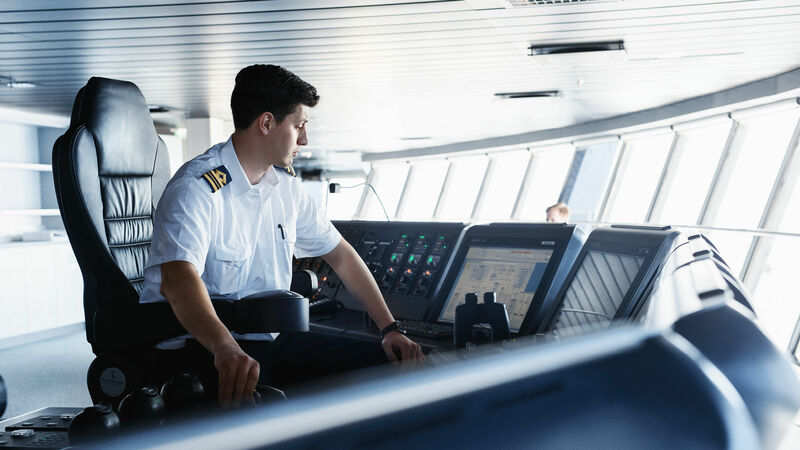 Wärtsilä’s competitive advantage lies in having the industry’s broadest marine focused offering comprised of leading, innovative products, integrated systems, and engineering, which is supported by a unique sales and service network in touch with customers globally. The field of competitors is extensive. It includes engine companies, such as MAN D&T, Caterpillar and HiMSEN, propeller makers such as Schottel and Thrustmaster, and environmental and auxiliary equipment providers like Alfa Laval. It also includes electrical and automation houses, notably Siemens, GE, ABB, and Kongsberg, pump and gas system providers, such as TGE Marine and Framo, and companies with broad offerings such as Rolls-Royce. Wärtsilä is recognised as a proven supplier of innovative and sustainable technologies across its portfolio serving the marine and oil & gas markets. The marine and oil & gas industries are at the centre of converging megatrends, namely a move towards a more diverse and cleaner energy mix, decarbonisation, increased transparency and accountability with regards to environmental performance, and a need to improve economic performance despite uncertainties in the global economy. For Wärtsilä it is clear that improved sustainability is central to addressing all these trends. Wärtsilä is committed to becoming the most valued business partner to its customers. Thus, it is essential for Marine Solutions to have sustainability at the very core of its product and solutions development. The company’s R&D and business development activities are based on a deep understanding of how these megatrends affect customers. The expansion and development of Wärtsilä’s offering to the marine and oil & gas industries over the years demonstrates the response made to the needs of its customers. Gas, environmental compliance, and efficiency are the three pillars on which Marine Solutions builds its offering. The global energy landscape is shifting towards a more diverse and sustainable energy mix, and natural gas – the cleanest fossil fuel – has a key role to play in this transition. During recent years, along with the increase in supply of natural gas, the oil & gas industry has seen a dramatic rise in demand. The marine industry is also affected by this transition, with interest in the use of gas as a marine fuel rising sharply. Wärtsilä develops products and services that enable the safe use, handling, and distribution of natural gas for the marine and oil & gas industries. Wärtsilä is the marine industry’s undisputed leader when it comes to gas-fuelled propulsion, with dual-fuel medium-speed engines ordered for more than 300 vessels, and more than 19,000,000 running hours having been accumulated in both land-based and marine applications. These milestones represent achievements that cannot be matched today by any other engine manufacturer. Thanks to a strong and safe track record in the use of gas as a marine fuel for LNG carriers, the industry is increasingly keen on expanding the use of LNG to other vessel types. Lower consumption of pilot fuel (just 1% of the total fuel used). Enabling the use of gas as a marine fuel means much more than merely applying a proven technology to gas engines. For Wärtsilä, it also means maintaining its leading position in the design of gas-fuelled vessels, and offering reliable and competitive gas storage and handling systems. Wärtsilä also supports the development of the broader gas value chain in the oil & gas industry with, for instance, its liquefaction and regasification solutions. The marine industry is undergoing the implementation of changes needed in order to comply with existing environmental regulations, while at the same time evaluating the possibilities for complying with upcoming regulations. Emissions to air (CO2, NOx, SOx, particulate matter, volatile organic compounds (VOC), and others) and water are under scrutiny. Similarly, regulations relating to safe and clean operations are becoming stricter, especially for the oil & gas industry. Wärtsilä offers a broad set of options for compliance with environmental regulations. All include working technologies, fast installation, and support throughout the company’s global network. Wärtsilä is committed to providing its customers and society at large with reliable and safe technologies for environmental compliance, which will be available for use as new regulations come into force. The company can also assist customers in evaluating the best options for compliance so as to adopt a solution that meets their specific operational needs. For emissions to water compliance: waste water, bilge water, scrubber water, and sealing systems. The global economic downturn has put enormous pressure on the cost structure of the marine industry in particular, while the oil & gas industry is also deeply affected by low oil prices. In the marine industry especially, the cost of fuel is a key driver for upgrading equipment, rethinking operational profiles, and for new vessel designs. Investments in improved energy efficiency have both economic and improved environmental performance benefits. Wärtsilä strives to optimise the lifecycle cost of installations. This is done because it makes economic sense to customers, and because of the company’s in-house understanding of the pressure for reducing operating costs. Hence, Wärtsilä is committed to investing in developing products and solutions that will help achieve significant savings for its customers. Furthermore, improved efficiency results in better environmental performance. In 2017 Wartsila launched the Wartsila HY, a fully integrated hybrid power module combining different power sources, an energy storage system, and power electronics optimised to work together through a newly developed energy management system. It is the marine sector’s first hybrid power module of this type produced, thereby establishing a new industry benchmark in marine hybrid propulsion and providing a lower environmental impact than conventional machinery solutions.